NASA’s Gateway to Astronaut Photography website continues to provide tantalizing evidence of UFOs in space. The latest in a series of astronaut photographs revealing UFOs taken during the Space Shuttle Program was ‘rediscovered’ two days ago, and reveal a very large triangular object on a descent trajectory towards the Earth. The photos were taken in 1986 during the Space Shuttle Columbia mission STS-61C. Is it space debris as NASA claims; an extraterrestrial mothership as some UFO researchers believe; or a highly classified government spacecraft called a flying triangle or TR-3B? The ‘rediscovery’ of the two photographs may be further hard evidence that something is flying in space near NASA space missions that is an unknown spacecraft of some kind. Fouche was a Director of Engineering and Senior Program Manager in the USAF and Department of Defense, and after retirement “worked for companies like SAIC, PCA, CEA, and SSAI.” He is the first major whistleblower to come forward to reveal details about a classified aerospace program creating antigravity craft capable of spaceflight – flying triangles. Fouche claims that the TR-3B generates an intense magnetic field that reduces its weight by 89 percent. He says that the TR-3B uses the Biefeld-Brown effect (created by large electrostatic charges) to reduce its weight so that more conventional propulsion systems such as scramjets can give it amazing speeds. This would be well above Mach 18 that he claims is the speed of the SR-74. Fouche claims the TR-3B is 600 feet across which would make it similar in size to an aircraft carrier. This is what Fouche believed was photographed by the NASA astronauts on STS-61C. When you compare the first and second photos, you see that the triangle UFO has turned in its position facing a new direction. Also in the second photo the UFO is 2X closer than in the first. Another thing is that the UFO moves closer to the edge of the Earth compared to the first photo where its slightly farther away. From the clouds which change position we can determine that the photos were taken less than minute of one another. Time stamp on #1 photo says 13:59:25 (Hours, Min, Sec) and photo #2 was taken at 13:59:42 so we now know there was 17 seconds in between the photos. This info tells us that it moves very fast towards the Shuttle Columbia which probably panicked the astronauts. Unfortunately, Waring is mistaken about the time sequence of the photos. 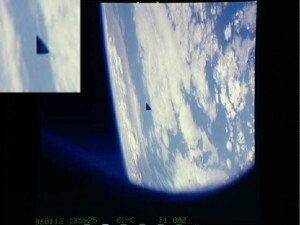 The photo with the larger UFO (“2X closer”) is the first in the sequence, which suggests that it is moving away, not towards, the Space Shuttle. So could the NASA photographs have been an alien star ship as witnessed by McClelland? Alternatively, could it be space debris as claimed by NASA? Or perhaps Fouche is correct that the triangular UFO is a highly advanced classified flying triangle, TR-3B, belonging to a secret military space fleet photographed by NASA astronauts.